Botswana is renowned for its great Elephant concentrations, and safari-goers are always impressed by the numbers, but there is also the opportunity to experience some unique Elephant behavior on a Botswana safari. 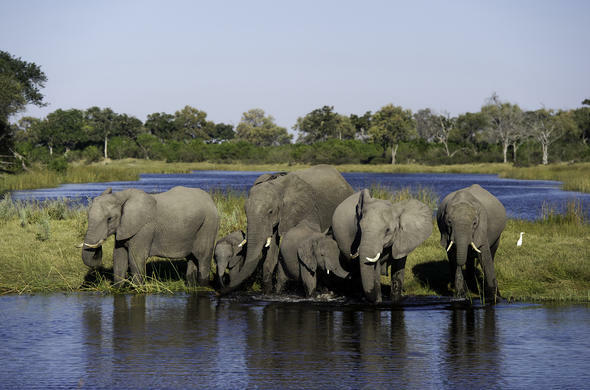 With the highest Elephant populations in Africa, Botswana is sure to provide Elephant admirers, and wildlife lovers in general, with plenty of activity and memorable sightings. There are the up close and personal interactions with habituated Elephants available, as well as the famous Elephant Back safaris, but it is the interactions with wild Elephants where Botswana stands alone as a safari destination in Africa. During the dry season in Botswana Elephants gather in their thousands on the waterways of Chobe, Linyanti and the Okavango Delta, allowing close up views of their behavior. Apart from the standard game drives the Elephants can be viewed from the water, whilst on boats and even Makoros [dugout canoes]. This viewing from the water provides a unique perspective of the behavior of Elephants. 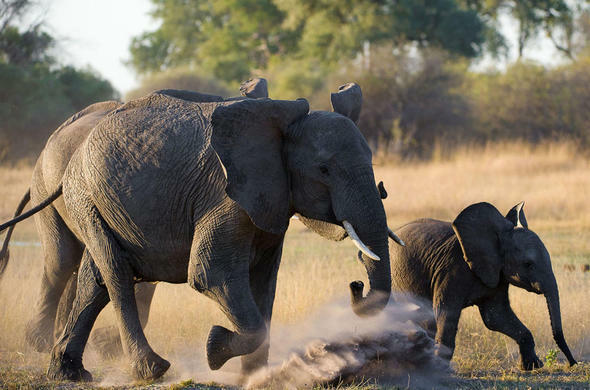 The Elephants of Botswana are very approachable in the reserves and private concessions, and as such provide the perfect subjects for Elephant enthusiasts. 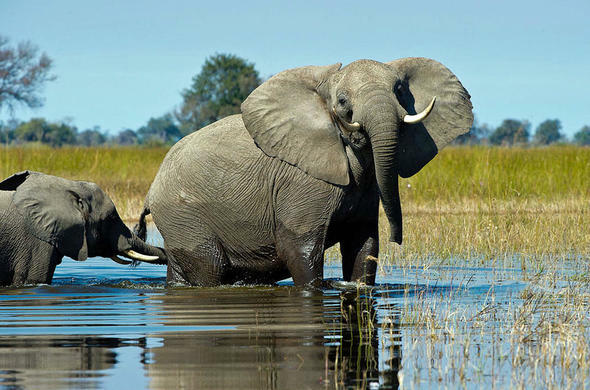 The floodplains of the Chobe and Linyanti Rivers during the dry season will provide the perfect opportunity to spend time observing Elephants, and the Okavango Delta is the ideal spot to enjoy watching Elephants in the water. 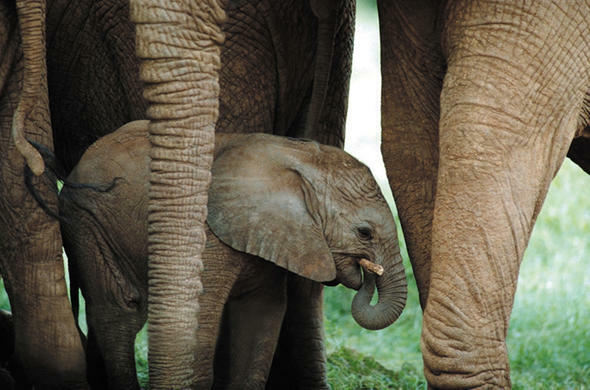 Animals are known to mourn the death of one of their own but this behavior is no more intimate than with Elephants where individuals scent and touch the carcass of a fellow Elephant. Personal observations include watching an Elephant stop at a long dried pile of bones and pick some of them up gently before placing them back carefully amongst the others. 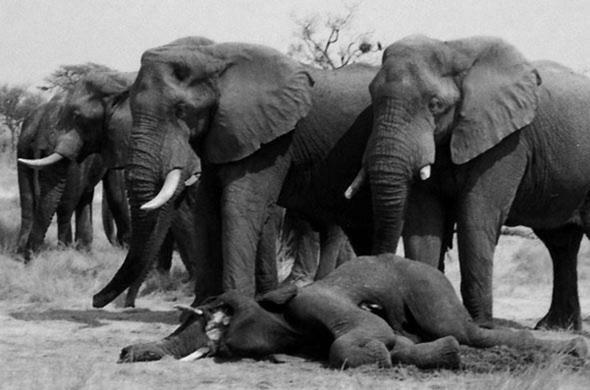 Another fascinating incident was when a dead elephant was the subject of much attention from Lions and other Elephants. Lions were attempting to move in and feed on the carcass but they were being kept away by other bull Elephants, some of which were scenting and touching the dead elephant. For all intents and purposes this behavior reflected a sort of mourning. But was this an example of mourning or merely the behavior of a species towards its own kind. With the dead Elephant others were touching and scenting and keeping the lions away but with another incident where an old bull was being eaten alive there was no such interaction.